Barcelona came from behind to avoid a fourth straight loss and beat Champions League-chasing Athletic Bilbao. The victory keeps alive their slim hopes of defending their title as they sit four points behind Atletico Madrid. Both sides hit the woodwork before Aritz Aduriz scored the 50th-minute opener for the visitors from outside the box following Marc Bartra's error. Pedro levelled from close range and Lionel Messi scored the winner two minutes later with a low free-kick. A lot of pre-match talk was about the future of Barca head coach Gerardo Martino following a disastrous eight-day spell. They were knocked out of the Champions League by Atletico Madrid, lost to Granada in the league last Saturday and then lost in Wednesday's Copa del Rey final to Real Madrid. Martino has refused to speak about his future beyond this season and admitted his side only had a "slight" chance of retaining their league title. Even with this comeback victory, it is likely to be a first season for Barcelona without any major trophy since 2007-08. They started reasonably at the Nou Camp with Athletic's impressive goalkeeper Gorka Iraizoz pulling off saves from Pedro and Messi. Messi, who had not scored in those three defeats, had a goal disallowed for offside when he turned in Andres Iniesta's curling pass. But Athletic showed their Champions League credentials and were agonisingly close to taking the lead when Aduriz's overhead kick hit the post with Markel Susaeta forcing Jose Manuel Pinto into a good save from the rebound. Alexis Sanchez hit the crossbar at the other end when, from close range, he had the whole goal to aim for, before Iraizoz denied the Chilean and Pedro. Early in the second half fourth-placed Athletic took the lead when Aduriz scored his 10th goal in eight games after Bartra failed to deal with the ball. Moments later they could have made it 2-0 but Susaeta was marginally offside when he put the ball into the net after Javier Mascherano's mistake. And after Pedro and Messi missed chances, the hosts finally got their breakthrough in the 72nd minute. Dani Alves picked out Alexis Sanchez, whose scuffed shot went straight to Pedro, who calmly converted from close range. And almost immediately they had a free-kick inches outside the box after Oscar De Marcos brought down Messi. The Argentine stepped up to fire the free-kick in the direction of keeper Iraizoz, who saw the ball late and let it squeeze past him. They could have had a late third when Christian Tello poked the ball past Iraizoz with De Marcos clearing off the line. And in injury-time he was almost made to pay when the ball fell to Mikel Rico but Mascherano did brilliantly to keep out the goalbound shot with Pinto well-beaten. Barcelona are four points behind Atletico Madrid, whom they host on the final day. Real Madrid, who have a game in hand on both clubs, are another two points off Barca. Match ends, Barcelona 2, Athletic Club 1. Second Half ends, Barcelona 2, Athletic Club 1. Offside, Barcelona. Lionel Messi tries a through ball, but Adriano is caught offside. Attempt blocked. Mikel Rico (Athletic Club) right footed shot from the centre of the box is blocked. Assisted by Mikel Balenziaga with a cross. Attempt missed. Cristian Tello (Barcelona) right footed shot from the centre of the box is close, but misses to the right. Assisted by Alexandre Song following a fast break. Foul by Francesc Fábregas (Barcelona). Ander (Athletic Club) wins a free kick in the attacking half. Substitution, Barcelona. Cristian Tello replaces Alexis Sánchez. Substitution, Athletic Club. Gaizka Toquero replaces Markel Susaeta. Attempt missed. Javier Mascherano (Barcelona) right footed shot from outside the box is just a bit too high following a fast break. Substitution, Athletic Club. Beñat replaces Ander Iturraspe. Francesc Fábregas (Barcelona) wins a free kick in the defensive half. Foul by Ander (Athletic Club). Attempt blocked. Ander (Athletic Club) left footed shot from outside the box is blocked. Assisted by Ander Iturraspe. Attempt saved. Markel Susaeta (Athletic Club) right footed shot from outside the box is saved in the centre of the goal. Gorka Iraizoz (Athletic Club) wins a free kick in the defensive half. Corner, Athletic Club. Conceded by Javier Mascherano. Adriano (Barcelona) wins a free kick in the defensive half. Goal! Barcelona 2, Athletic Club 1. 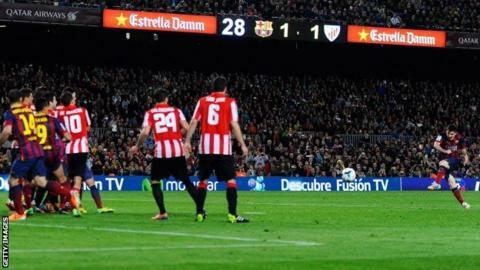 Lionel Messi (Barcelona) from a free kick with a left footed shot to the bottom left corner. Goal! Barcelona 1, Athletic Club 1. Pedro (Barcelona) right footed shot from very close range to the bottom right corner. Assisted by Alexis Sánchez. Ander (Athletic Club) is shown the yellow card for a bad foul. Andrés Iniesta (Barcelona) wins a free kick on the left wing. Substitution, Barcelona. Francesc Fábregas replaces Xavi.